Visit Sea Fortress Suomenlinna and Rock Church for their historical value. Museum-lovers will get to explore Seurasaari Island and Open-Air Museum and Vantaa Art Museum. 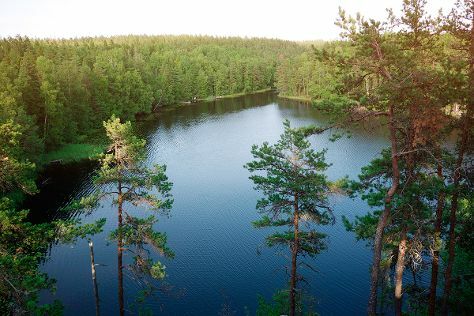 Explore the numerous day-trip ideas around Helsinki: Nuuksio National Park (in Espoo) and Sipoonkorven Kansallispuisto (in Vantaa). The adventure continues: pause for some serene contemplation at Helsinki Cathedral, wander the streets of Katajanokka, meet the residents at Korkeasaari Zoo, and glide peacefully along the water with some of the best stand-up paddleboarding in the area. To find other places to visit, more things to do, and more tourist information, go to the Helsinki trip builder tool . George Town, Malaysia to Helsinki is an approximately 18-hour flight. You can also do a combination of ferry and flight; or do a combination of ferry, train, and flight. The time zone changes from West Indonesia Time (WIB) to Eastern European Time (EET), which is usually a -5 hour difference. Traveling from George Town in June, things will get colder in Helsinki: highs are around 21°C and lows about 11°C. Finish your sightseeing early on the 7th (Fri) to allow enough time to travel back home.